Whenever your audience is most likely to see and engage with your great content. A well-timed post can lead to more likes, comments, shares, and click-throughs. In this guide, we’ll tell you the best times to post—according to Hootsuite data. Our findings are based on years of testing on our own channels, as well as an analysis of over 400 million posts from Hootsuite users. We’ll also teach you how to use the data to inform your own publishing schedule. The best time to post on Instagram is from 12 p.m. to 1 p.m. Monday to Friday. To find the best posting schedule on Instagram, our own social team considered our audience and what their typical day looks like. Do they check Instagram as soon as they get up? On their way to work? At work? We used those considerations to begin testing blocks of time and tracking when we received the most engagement. Your results will likely be different—especially if your relationship with the audience is more business-to-consumer (B2C). In that case, you should test off-work hours like 7 p.m. during the week and various times throughout the weekend. Finding the best time to post on Instagram—or any social network for that matter—is about knowing your audience, testing different times, and measuring results. In another study, we found that the best time to post on Instagram varied greatly depending on your industry. Pew Research found that 71 percent of Facebook users visit the site every day—more than any other social network. People login from both their desktop and mobile devices (at work, home, and elsewhere), but mobile use is increasing. In fact, at least a quarter of Facebook users in 14 markets around the world are mobile-only users. Despite the complex News Feed algorithm, our social team discovered those publishing times often see a higher number of likes, comments, shares, and click-throughs. We see lower engagement on the weekends, but there is often a spike in click-throughs for posts published between 12 p.m. and 1 p.m. on Saturday and Sunday. There are a number of other studies out there that report Thursdays and Fridays from 1 p.m. to 3 p.m. work well. And we see similar results for many industries in our analysis of Hootsuite userdata. As always, you should test and track results for yourself. Use engagement data from Facebook Page Insights or other measurement tools such as Hootsuite Analytics to determine what works best for you. “For us as a B2B organization, the best times to tweet are between 12 p.m. and 3 p.m. on weekdays, with the highest amount of clicks and retweets occurring at 3 p.m.,” explains Wood. But again, this will differ depending on your audience, location, and content strategy. If you’re a business-to-consumer (B2C) brand, you may find that tweeting when your followers aren’t working—before 9 a.m., at noon, and after 5 p.m. during the week—is best. Looking at an aggregate of Hootsuite userdata shows us the most popular days to post on Twitter are Monday to Friday, and the most popular times to post fall between 9 a.m. and 4 p.m. But those insights aren’t industry-specific. If we focus on consumer staples, for example, we see that 58 percent of all tweets are sent during working hours. Use the data as a starting point, test different posting schedules, and compare results. LinkedIn is a professional network, so posting during working hours makes sense. That said, 57 percent of all LinkedIn traffic comes via mobile. Like Facebook and Instagram, LinkedIn’s algorithm is designed to show you the most relevant content. Here’s what the Hootsuite social team has learned about LinkedIn publishing. The best times to post on Linkedin are 7:45 a.m., 10:45 a.m., 12:45 p.m., and 5:45 p.m. Monday to Thursday. “The Hootsuite social team posts on the 45-minute mark because most brands are posting on the hour,” Wood says. And that brings up an interesting point. When you hear about the best or most popular time to post, we recommend you test and measure the results against a wildly different schedule. Think your audience only engages with your content on the weekends when they are at home relaxing? Try workday hours. The results may surprise you. And yes, maybe a larger share of your audience is online over the weekend, but are all your competitors flooding those times with content? You might benefit from posting off peak hours when competition is low. Our own social media team explores what the phrase “best time to post” means to them in this episode of the Hootsuite podcast. Listen now. How old are they? Where do they live? What’s their commute like? What do they do for work? What are their challenges and pain points? What social networks do they use? Do they scroll through their feeds on a phone or computer? Those are the types of questions you need to answer to figure out the best publishing schedule. Our guide to creating audience/customer personas will walk you through each step of this important exercise. Like any good experiment, you need consistency to accurately measure results. When testing times, use the same or similar content. That way a less than engaging post shared at a high-traffic time won’t skew the results. If you’re based in the PST time zone and have followers in the EST and GMT time zones you might find posting at 8 a.m. PST works best because it hits the workday in both other regions. If you have a global social media you could create different social media handles for different regions. Or, simply schedule content throughout the day and night for 24-hour engagement. The point is location matters. If 6 p.m. on Thursdays is a good time to post for retail brands, that’s 6 p.m. for the target customer, not necessarily the brand. Obviously we’re partial to Hootsuite. From a single dashboard you can post to all of your social channels and use built-in analytics to see which times yield the best results. Once you have that information you can schedule all yours posts during those periods. 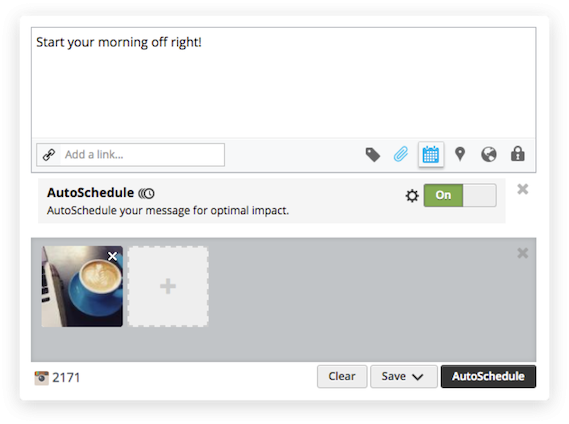 Hootsuite also has a feature that will automatically schedule your content based on optimal engagement times. You can use AutoSchedule from both the dashboard and the Hootlet Chrome extension. When do your competitors get a high amount of likes, shares, retweets, reactions, and comments? Test those times as well as an opposing schedule. Do you also get more engagement at noon on weekdays? Or do you see a boost on the weekend when your competitors are quiet? The question here is whether you should follow suit, or zig when they zag. You should also take note of what the leaders in your industry are doing. If you’re representing a smaller company, look to larger organizations with sophisticated social strategies. Chances are they’ve had the time and resources to optimize their publishing schedules. But remember that it’s different for every business and audience. Take your cues from the leaders, but always run tests to optimize for your own audience. Don’t get complacent. Find the times that work best for you, but never stop testing. Audience habits—and network algorithms—change. Be sure to create social media reports to track when you get the most engagement for each posting time. And determine how often you’ll rerun experiments on your social channels. Now that you know how to find the best time to post, use Hootsuite to easily run tests, measure results, and schedule your content for optimal engagement.